In the future, many of you will claim they were there for today’s Confessions of a Mashup Un-Artist presentation by Brian Lamb. You will claim you were dancing on top of the school bus, poking your head in the tv sets, grooving to the wild audio remix he concocted. How often do you hear a comment from someone in the audience that says a presentation was “transformative”? And honestly, calling what Brian put on today a “presentation” (which suggests the linear yawnfests of clicking slides) is a misjustice- it was a Performance. Art. It was a Moment. Well, I think so. I am sure a lot of folks in the audience were saying to themselves… “what the hell was THAT?” or “that was interesting, but how do I use that in the classroom?” Its good a good sign when people have strong reactions to art, good or bad– cause it gets a visceral rise. Ahh, but I better back up. When we were planning to do an online symposium on mashups, I knew we had to get Brian as a speaker, if anything for his EDUCAUSE Review article Dr. Mashup; or, Why Educators Should Learn to Stop Worrying and Love the Remix where he even managed to get them to attach an audio remix to the online version of the paper. 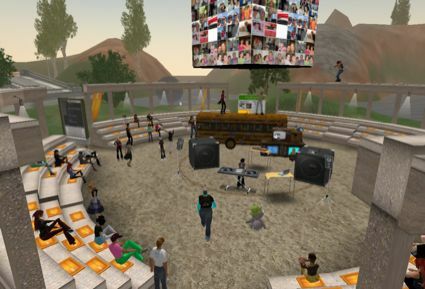 For a previous NMC online conference where he spoke, Brian tried to convince us to let him do a prepared audio file in advance, and we talked him out of it- what kind of presentation is it when you jjust click “play”? But when we started talking about this conference, I thought it was relevant. So we had no idea exactly what Brian was going to mix up. Then I threw him a monkey wrench; with a schedule change, we needed to move Brian’s presentation originally scheduled to be done in Adobe Connect, to now take place in Second Life. After all, we could play lots of media. Brian was a bit reluctant, being humbly shy about his SL abilities. But he was game, and we met last week, he as Gus Goldkey, he started asking, “Can you get me a turntable… and some speakers, amps… and mixers… and… a School Bus!” The latter was apparently his dream to act out the end part of a Plasmatics video (that’s the Arizona desert they are mashing up)– which really had me wondering what he had up his sleeves. Sure, why not. I went shopping, and got some audio things. My NMC colleagues gave me copies of giant speakers and TVs. I actually went out and spent L$700 (about $2) on a school bus, and then asked some people, and ended up with another 5 free school buses. 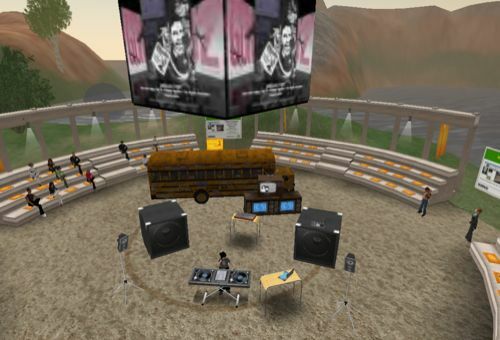 Who knew there were so many yellow school buses in Second Life? Then he asked about applying audio effects to the SL voice client. I knew there was software to do this, as some people prefer to not have their real voice in the virtual world. I found a blog post describing how to do this with SoundFlower (free) and Garage band and woot! it worked. So we had this tricked out set of audio equipment and stuff. 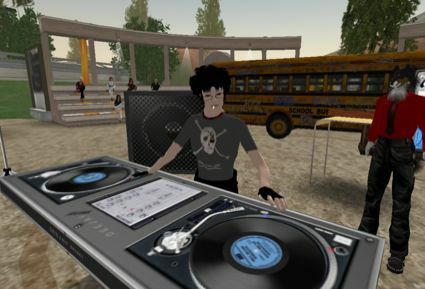 Brian’s plan was to run a 25 minute remix audio .My first plan was to connect the mp3 audio to the SL music channel and tell people to play it. Then last night it struck me, Doh! There’s no way to assure they will hear the content at the same time, it depends on when they click, their connectivity…. So the new idea was to put the mis into my iTunes, then use NiceCast to send it out as a live stream via our Limelight audio server, and this way, it would get to most listeners together. I ran this from my MacBookPro, and then did Second Life on my PC so I could be there and hear he sound. So.. after all tis pre-amble, here is the “presentation” with mixes of sounds, music (I hear Fleetwood Mac among others) and the voices of various people, like visionaries such as McLuhan and Gardner Campbell (there you go Dr Glu!). Confessions of a Mashup Un-Artist (57.5 Mb MP3, 25:06). We had up on the giant 4 sided screen a set of rotating images. It was supposed to be so the last 8 minutes was the visuals from a great remix Brian located on the Internet Archive, Story Without End that then merged into the Wendy Williams mad bus driver section of the Plasmatics video but I had forgotten to wipe out the audio track… so we played the video at the end of the audio stream. But its not just about being silly goofy in Second Life, anyone can do that. Brian pushed every edge of a presentation, and really put a “New Media” in our faces and say– take this seriously! A lot of people probably slunk off in horror, but I am hoping some will go back to this experience, and listen carefully to what was artistically created by Brian– cause remixing is more than just dumping some files into a blender. The notion of teacher as DJ may have been implied when people started applying the “rip-mix-burn” metaphor to education, but lately I can’t seem to get it out of my head. The similarities were there even when teachers worked primarily with paper textbooks and printed research articles, but is even more pronounced now in the era of digitized resources. There are the obvious similarities”¦ Both start with a collection of existing materials – acoustic resources like songs, sound effects, and samples, and educational resources like simulations, tutorials, and articles. Both sequence and blend these materials in interesting ways. Both do quite a bit of planning (think syllabus as playlist), perform in discrete blocks of time (think course meeting as set); and both have to make meaningful connections between the resources they choose to employ (think lecturing and discussion leading as beat matching). Its not outrageous at all, to me. Okay, Brian, I know your humility /humbleness are huge but please accept my gratitude for going way over the top, and busting the doors off of what a conference session can mean. We need more. I WAS there, and I was thinking the same thing…legendary experience. I was dancing in front of the screen on the box in the sky and couldn’t make the animation stop till I quit SL.